Shop the limited-edition Nicole Richie for Impulse collection, only @ Macy’s in select stores, macys.com in Macys here. Nicole Richie stars in the ad campaign for her limited-edition collection! Coming to macys.com/impulse and select Macy’s in September! Check out more of the pictures here & twitter here. On the red carpet and on the go, Nicole often incorporates bold yellows into her look. From tops and blouses to silky gowns, Nicole rocks golden hues that are fun and flirty as well as sophisticated. Try adding Nicole’s style to your look this summer. Choose a printed yellow maxi dress to wear by the pool, or add a pop of yellow to your accessories like shoes, or sunglasses. Adding yellow can instantly revamp and brighten your look, creating the perfect summer look. Make Nicole’s style your own, how would you incorporate yellow into your look? Kicking off her month as Polyvore’s guest editor, Nicole gave us a look at what’s in her bag. Among her essentials are iPhone, spf lip balm, bobby pins and her favorite assortment of House of Harlow 1960 rings and sunglasses. To see all of her items, check out her feature on Polyvore. What do you have in your bag? Are any Nicole’s essentials in yours? Stay tuned next week to see what items Nicole uses to get ready in the morning. 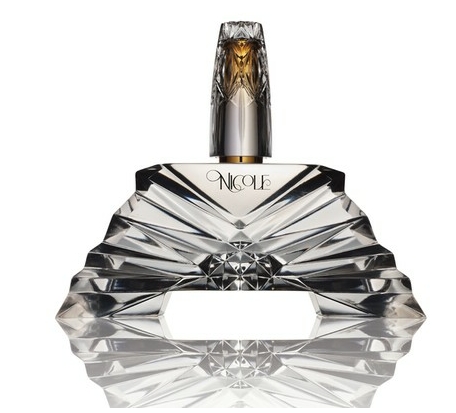 With a scent reminiscent of the ladylike qualities of her mother, Nicole’s first fragrance is due to launch this September. The fragrance holds notes of blackberry, orange, vanilla, golden amber, Moroccan rose, lily of the valley and papyrus, and sandalwood along with a few other ingredients. To read the rest of her interview and more details about her upcoming fragrance, check out the whole story at WWD. Will you be wearing her debut scent? It may be two months until it officially hits stores, but that didn’t stopNicole Richie from celebrating her upcoming Macy’s Impulse collection on Wednesday night. The designer gave a sneak peek of the line at Daniel in New York City wearing a black and white bird house print blouse, leather leggings and Balenciaga heels. We can’t wait to see what else Nicole came up with when her Impulse duds roll into 100 Macy’s stores in mid-September! Fashion Flashback! Earlier this year, Nicole was featured on the cover of the March issue of C Magazine as well as an inside feature. We loved her fearless fashion that takes on runway trends. One of our favorite looks was this feminine high waisted blue pleated skirt, skin-baring print top with a pair of pink pumps to make the whole outfit pop. Make this look your own, how would you wear it?